SHOOTING THE SHIZNIT : Reno Diamond Jailed!! MEMPHIS, TN (WMC-TV) - Memphis police are investigating a leak inside Crime Stoppers that may have helped an accused murderer stay on the loose. 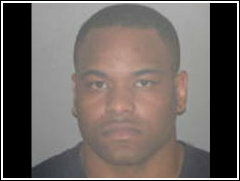 Thursday, officials said Travis Williams was in the Shelby County Jail, charged with accessory after the fact. According to an arrest warrant, Williams was on duty taking phone calls and tips in the Crime Stoppers call center on Wednesday night when he took a tip from a person with information on where to find Cleo Henderson. Henderson is wanted on a first degree murder charge for killing Memphian Rueben Jefferson last January. According to police, Williams is accused of taking the tip, and then calling Henderson to tell him that police knew where he was, and that, "he should leave before police get there." "The fact that this individual knew the person that was being called about is amazing, said Buddy Chapman, Executive Director of Crime Stoppers. Thursday afternoon, Chapman defended Crime Stoppers' record, despite the bold double-cross. "We've got a 25 year plus history of that, and we don't want anybody to be reticent," he said. As of Thursday afternoon, Henderson was still not in custody. Meanwhile, a judge set Williams' bond at $250,000.